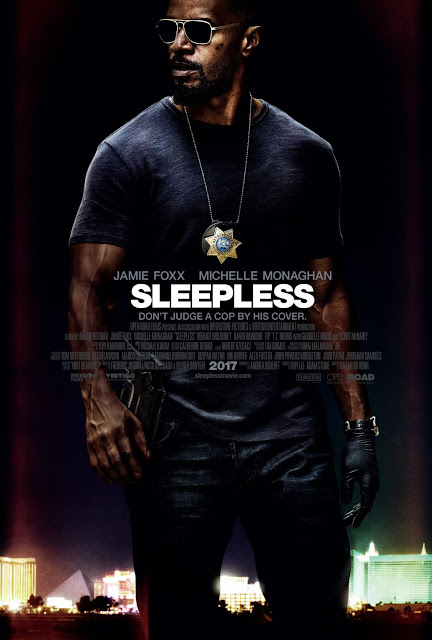 Chrichton's World: Review Sleepless (2017): Watch the original instead! Review Sleepless (2017): Watch the original instead! The original Sleepless Night a.k.a. Nuit Blance hardly was a masterpiece. It had it's flaws. But it was an incredibly effective action thriller. This remake is anything but. Unless it's goal was to put you to sleep. Normally I would go into rant mode and explain to you why I think remakes in general are useless. I kinda have learned to let go of that and give these remakes a shot since sometimes they can still be fun. And that's all I was hoping for. At least I was expecting some solid action. Turns out even with significantly lowered expectations I asked too much since Sleepless can't even deliver that. It is as generic as it can be with zero tension or adrenaline. Biggest problem of the whole film was that I simply did not care about anything or anyone. It's the one thing the original excelled at. We were rooting for the main character to get his son back despite the odds that were stacked against him. In this remake that element didn't even seem to be as important. Main character Vince (Jamie Foxx) barely shows emotion and for the most time treats everybody the same. You would think that he would be more affectionate towards his son. There isn't a single scene where Vincent's despair is shown. Because he never is. He acts like he is used to the events occurring. Which was the point of the story in the original. I want to give director Baran bo Odar the benefit of a doubt but to ignore something that essential is stupid. Instead Sleepless focuses on the done to death elements like corrupt cops and whatever. It was the least interesting in the original and it is the least interesting in this remake. I have nothing against Michelle Monaghan but I simply didn't buy her as a cop. Her attempts to be as though as nails were laughable. Would have been perfect in a parody movie but in here it detracts and distracts. Sleepless is not enjoyable nor decent. Avoid!